Hi! In this tutorial let's see how to create dynamic dependent select box using codeigniter, ajax and jquery. If you wonder what dynamic dependent select box is, then they are the parent-child dropdowns in which the contents of the second dropdown solely depends on the option selected on the first dropdown. And the best example for such dynamic dependent select box is the country state city drop down list and here I'm going to show you how to create them in codeigniter and jquery ajax. And creating dynamic dependent select box in php is straight-forward but implementing them in a MVC Framework like CodeIgniter gets little tricky. But don't worry; I'll walk you through the process step-by-step so that you can understand it easily. 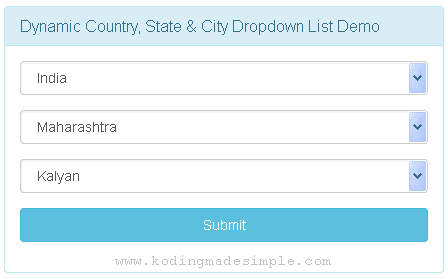 Here the idea is to create three drop downs in an html form for country, state and city resp. and populate country names in the country dropdown from database on load. After that selecting a specific country should load all the state names related to the country and choosing a particular state should load the city names available under the state. Since refreshing the form every time the user picks a country or state would be awkward. So we are going to use jQuery AJAX for updating the select box options as many times as required in a discreet way. First create the database required for this example. 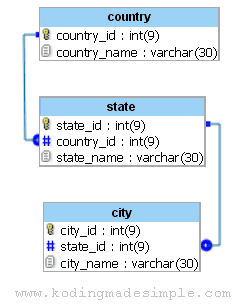 I'm using MySQL DB here and you'll need three tables 'country', 'state' and 'city' which are related to each other like below. Here's the sql command to create the above tables. And I have also included some sample records to run the demo. Then create a model file with functions to fetch country, state and city names from mysql database. You have to place this file inside 'application/models' folder in CI. Next create the main controller for this demo inside 'application/controllers' folder. Here's the code for the controller file. Along with the index() function we have two more functions in the controller namely, populate_state() and populate_city() to which we'll send the ajax request. These methods in turn communicate with the model functions we have created in the previous step and return the state and city details as JSON to the ajax call. This is the user interface for our example. The file creates a form with three select boxes. Place this file inside 'application/views' folder. In the view we have two jquery functions, one to load state details and another for city in the respective select boxes via ajax call. And jquery's ajax() function has been used for this and will be triggered when user choose country or state from the drop downs. Also the function sends and receives data in json format and including the option dataType: 'json' ensures it interprets the data properly. That's it! We have everything in place. Just run the controller and a form will be shown with three dropdowns with country names alone loaded from the database. Selecting a country name will load 'State' combo with options and selecting a state name will load 'City' combo with available city names.